Aeromotive A1000 fuel pumps are the pumps that started it all--they are durable, reliable, good looking, and they support high horsepower. Featuring a 600 lbs./hr. flow rate at 13.5 V and 45 psi, these A1000 fuel pumps are perfect for the daily driver that doesn't run like a daily driver. No wonder the Aeromotive A1000 fuel pumps are rated number one at the track and on the street! Fully submersible for custom, in-tank placement. O-ring fittings are required. 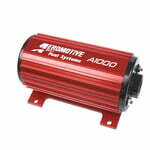 For EFI applications use regulator P/N 13101 or P/N 13109. For carbureted applications use regulator P/N 13204. Aeromotive, Inc. products are warranted to be free from defects in material and workmanship for one year from the date of purchase. Aeromotive, Inc. is interested in customer satisfaction, and has and will continue to make exceptions to their warranty period on an individual and case-by-case basis.